At Bishop Seabury Academy, our parochial high school located in Lawrence, the headmaster acknowledged in a letter to parents that now more than a third of the current student body was born before 2001 and the school would be taking a less intense approach to remembering 9/11. We say we will never forget, but then the rows of gravestones at Gettysburg, or Arlington, or other places reminds us that while we may never completely forget, we never completely remember either. In spite of our best intentions, even only 14 years later, the shock of 9/11 is slowly fading. You see, it doesn’t take long to forget. Like the assassination of President Kennedy, or the attack on Pearl Harbor or, even President Lincoln’s assassination, national calamities are deeply remembered for a generation and then they begin to fade. This is the core of all remembrance. That each generation would pass on to the next generation the values, the stories, the cultural and religious narrative, which informs the emerging reality. You, are part of an emerging reality! You, my dear brothers and sisters in Christ, are part of something new. Some might say it’s a bold experiment but, if it is, it finds its roots in 2000 years of preparing people for lay and ordained ministry in the Christian tradition. It has been a relatively short period of time in the history of the Church when people could study full-time in residential settings outside a monastery! And so here we are, the Bishop Kemper School for Ministry, introducing a new order of things. To believe that rigorous study is possible in an unaccredited educational institution. To believe that spiritual formation is at the foundation of any theological preparation of any consequence. To believe there is something crucial about studying in the context of the Midwest which finally better prepares people to serve in the Midwest. To believe the quality of the thing is not solely dependent upon the price of the thing. To believe that adaption, innovation, and perseverance are key criteria to becoming effective lay leaders, priests, and deacons in a spare season…. For the Board… for faculty…. for students… for friends and family. The board wonders how this can be a sustainable educational model. The faculty wonders how they can continue to do all that they do. The friends and family are wondering if all this effort…all this driving and lost weekends will turn out to be “worth it” for their beloveds. And make no mistake about it. This is a school whose sole focus is to create disciples of Christ! So, what does this mean in the modern era? Into what are we calling each of you students? Now, to “be sober” is not simply the opposite of drunkenness. Sobriety is, to be clear, to have achieved clarity. It is to be truthful in a world of frivolity and make-believe. In the beginning, I thought what we needed to transform the Church were people who were deeply faithful. Then, I decided that they needed to be smart, too. Intelligent; that would be the ticket! But in the end, I discovered that faithful and smart weren’t actually enough. It turns out had to be resilient. They had to be tough…without becoming hard. They needed to be able to cowboy/cowgirl up. Or, if you prefer the urban equivalent of this expression, “They needed to be able to put on their big boy/big girl pants and get on with it. I’m starting my 13th year as Bishop of Kansas and I can tell you that the road to successful ministry is littered…literally littered… with lay leaders, deacons, and priests who had no earthly idea this work could be so difficult. They had no idea whatsoever! My friends, this only looks easy! To Do the Work of an Evangelist. We have to ask for the order. We don’t, it would seem, know how to give a cup of cold water to people who are absolutely thirsting to death. To Carry Out Your Ministry Fully. Now this is a part of ministry we’ve gotten more lax about in recent years. Along with the vows of chastity, obedience, and poverty, the ancient monastics also took vows of stability. Because, it became clear early in the Christian monastic experience that there was an unnatural and unhealthy quality to those monks who moved around from place to place to place. They could never mature and deepen and become the people God called them to be if they always escaped hard things by going to the next place. 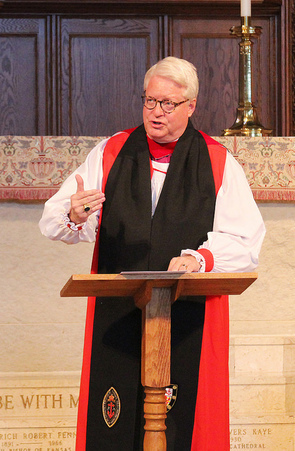 The Episcopal Church is being dismantled by 2 and 3 and 4 year ministries…that’s just not long enough to build the relationships, and to deal effectively with the resistance which comes with being a transformative leader; a “change manager,” to use the common term. Jesus said, My yoke is easy and my burden is light.